Old PC components are obsolete, MS-DOS is not available on any new PC… It is time to think about a proven migration solution ! Don’t worry. A simple and economical solution exists. Why don’t you ask NAPA for a budgetary quote to take preventive action ? 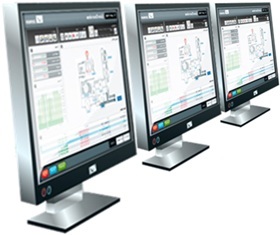 NAPA has already executed a number of CVU/TISTAR®, SIMATIC®PCS or SIMATIC®PCS7/505 system migrations to zenon® Operator v7.20 from Copa-Data, one of Europe’s fastest growing HMI and SCADA systems. Copa-Data employs more than 200 people worldwide with over 80.000 licenses in 50 countries, covering Food & Beverage, Pharmaceutical, Automobile industries as well as Utilities and Power distribution. zenon® includes a native CTI driver allowing Ethernet communication to your CTI PLCs and/or Simatic 505® PLCs equipped with CTI 2572-A communication module. And of course, there is no need to modify your PLC program. Over time, we have developed semi-automated tools to generate much of zenon® database by importing data from the CVU/TISTAR®, SIMATIC®PCS or SIMATIC®PCS7/505 system configuration export to text file. This obviously limits human errors and speeds up the migration process. Consequently we believe our offer is very competitive. From the synoptic pages and the variables configured on the CVU/TISTAR®, SIMATIC®PCS or SIMATIC®PCS7/505 system we will develop the same configuration on zenon® in order to minimize re-training of your operators. We will re-use as much as possible from our previous CVU/TISTAR®, SIMATIC®PCS or SIMATIC®PCS7/505 system migration projects (layout, symbols, navigation, trend, alarm and loop pages…). We have our own CVU/TISTAR®, SIMATIC®PCS or SIMATIC®PCS7/505 system to allow us to restore your backup and to perform parallel testing of the zenon® configuration compared to the original CVU/TISTAR®, SIMATIC®PCS or SIMATIC®PCS7/505 configuration connected to CTI PLC’s. By doing so we can perform a 100% test of your migration before delivery. You will also be able to keep your old CVU/TISTAR®, SIMATIC®PCS or SIMATIC®PCS7/505 system running in parallel to the new zenon® system the time needed to get used to the new interface and until your operators are confident that the CVU/TISTAR®, SIMATIC®PCS or SIMATIC®PCS7/505 system can be definitively removed. We usually let you order the Windows PC from your local provider based on our minimum hardware specification. Depending on your requirement, you can opt for CTI 2500-VP15A 15” or 2500-VP12 12” touch panel or a standard PC with single, dual or more monitors. Of course we are available to discuss any extra requirement you may have if you prefer to do more than a one-to-one migration. CVU migration offer : How to provide NAPA with your CVU configuration ?